This past weekend I passed by All City: LA Street Art show near the LA River. It was an apt setting since all the artists featured were strictly illegal street graffiti artists and for some, the first time their work had been hung on a wall! 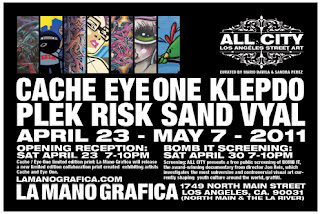 I was already familiar with Risk (one of the artists representing LA in the "Art in the Streets" at MOCA,) Vyal and Cache's work around the city. 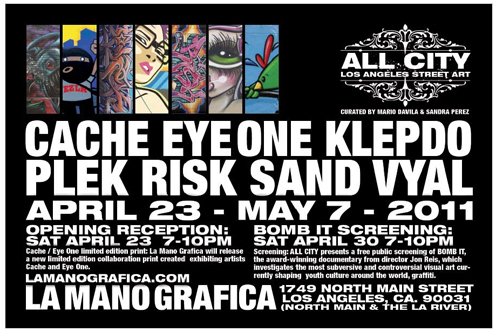 The show runs until May 7th, but you should go visit this Saturday April 30th as there's a *free* screening of "Bomb It," Jon Reiss' documentary on the graffiti scene featuring tons of artists and in the other corner, Joe "the graffiti guerilla" Connolly!